The latest round of tasks are here for Battle Royale, in the form of the Fortnite Week 4 Challenges, as we approach the halfway point of Season 8. In our Fortnite Week 4 Challenges guide, we'll be outlining all seven tasks that you can complete for this week, to earn as many Battle Stars as possible. But if you instead need help with any other areas of Epic's Battle Royale game, you can head over to our main Fortnite Season 8 guide. Here we've compiled a list of all past and present challenges for the current seasonal event, and much more. Just below, you can see the array of new Fortnite Week 4 Challenges. As always, there are seven total challenges to be completed for the week. Three if you don't own the Battle Pass, and four additional challenges if you do own the current Season 8 Battle Pass. Use the Baller in different matches (5). Get an elimination with a scoped weapon and a suppressed weapon (2). Launch yourself through structures with a Pirate Cannon (25). And there you have it, the full list of Fortnite Week 4 Challenges. 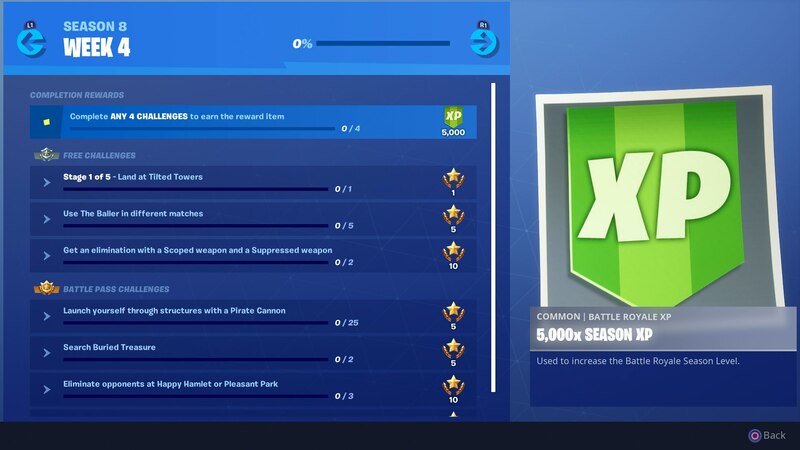 There's really not a whole lot going on with these challenges this week, as apart from the Buried Treasure challenge, there's really nothing that'll require much effort in order to complete. Tagged with Action,	Battle Royale,	Epic Games,	Guides,	PC,	PlayStation 4,	Shooters,	Survival,	Switch,	Xbox One.